Our lone duck greeter at Buffalo Bend Nature Park. A lone duck greeted my dog and I as we began our evening walk in the brand-new Buffalo Bend Nature Park, his skittish companion hiding in the tall grasses around one of the three wetland ponds scattered throughout the 10-acre greenspace that officially opened to the public in early February. The glossy green duck cocked his head at Waffles, my tiny terrier—who, for her part, simply ignored him—before turning his back on us and squatting back down at the end of a short pier, perhaps taking in the sunset, or whatever ducks do when left to their own devices. It was, perhaps, a minor disappointment. Buffalo Bend was designed as wildlife conservation area here along the Turning Basin in an otherwise industrial part of the East End, and I expected to see at least a few more waterfowl taking advantage of the grassy wetlands, yet our walk under dusk-darkening skies was otherwise quiet. Still, my disappointment didn't last long once I began exploring the rest of the park. Look for interpretive guides and trail maps throughout the park. Two other families were taking advantage of the peaceful evening in the same way as Waffles and I were: strolling the wide, crushed gravel trails that traverse the ponds, admiring the tall cattails whose cotton-headed stalks swayed gently in the light breeze, pondering the giant concrete culverts placed in the center of one wetlands area to create what looks like an above-water, man-made coral reef. 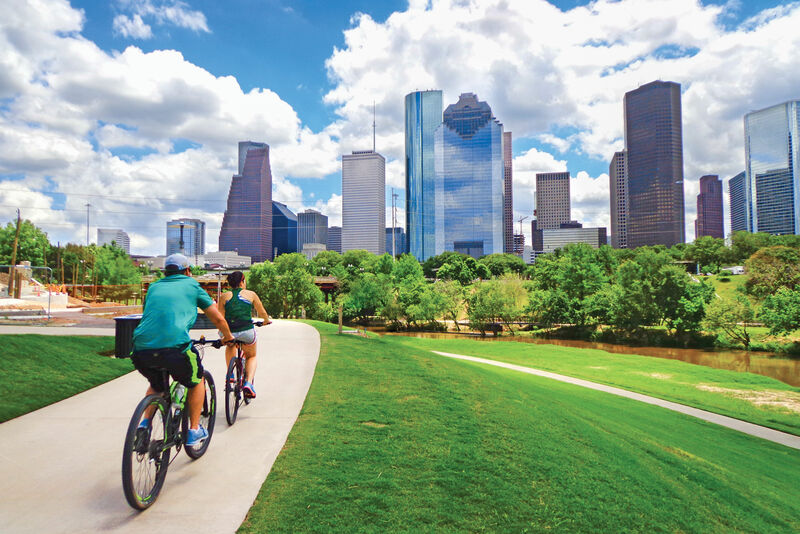 Those concrete pipes are riprap reminders of the park's previous life as just another scrubby patch of industrial land near the Houston Ship Channel. After 12 years spent in development, Harris County Precinct 2 and the Buffalo Bayou Partnership (in conjunction with Texas Parks & Wildlife and the Harris County Flood Control District) were finally able to make use of federal funds to renovate the space into the $2.8 million stunner it is today. 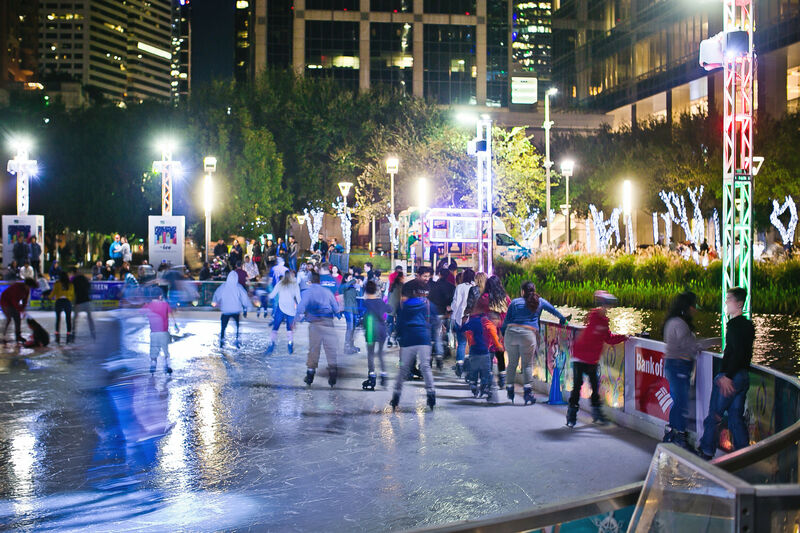 Those federal funds came with a caveat, however: the land could only be used for "passive recreation," not for a city park filled with lighted tennis courts and a swimming pool. 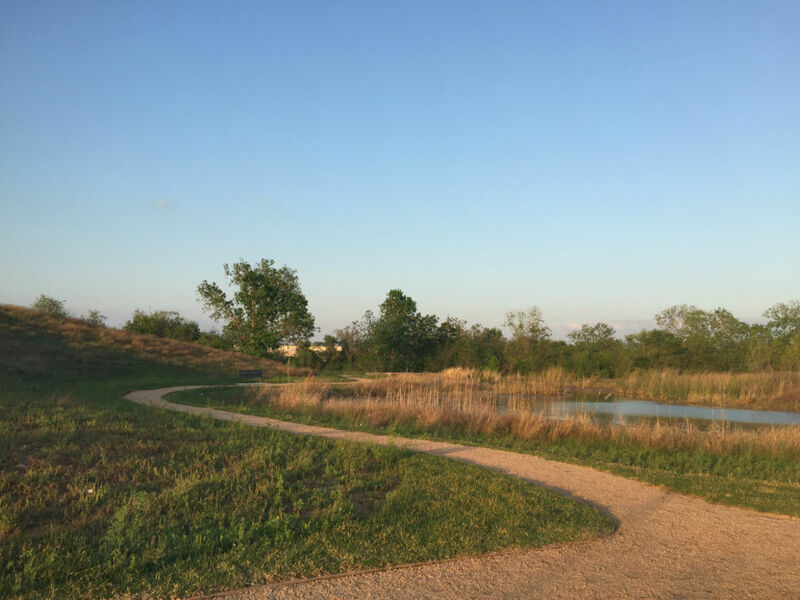 Connecting loops of trails run alongside the park's three wetland ponds. Hence the wetlands that make up Buffalo Bend Nature Park today, a reminder for modern-day Houstonians that the banks of Buffalo Bayou were once as still and serene as the ponds here are today—before the Ship Channel was dredged, before the Turning Basin was carved out, before concrete riprap and oil tankers lined its shores. 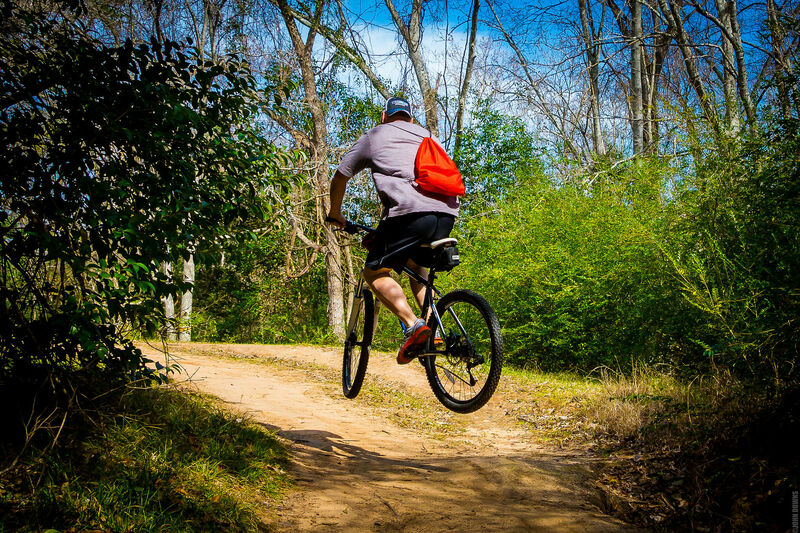 Reclamation aside, the park also makes for a pleasant hike-and-bike destination, and it's only going to get better from here. 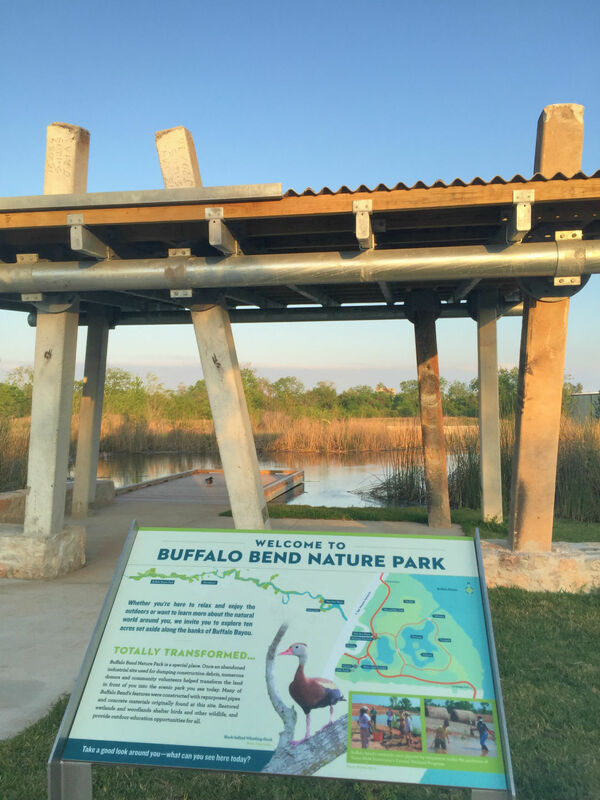 Plans are underway to connect the hike-and-bike trails and greenspace of Buffalo Bend Nature Park to the nearby Hidalgo Park, for a total acreage of 23 square miles of both passive and active recreation. 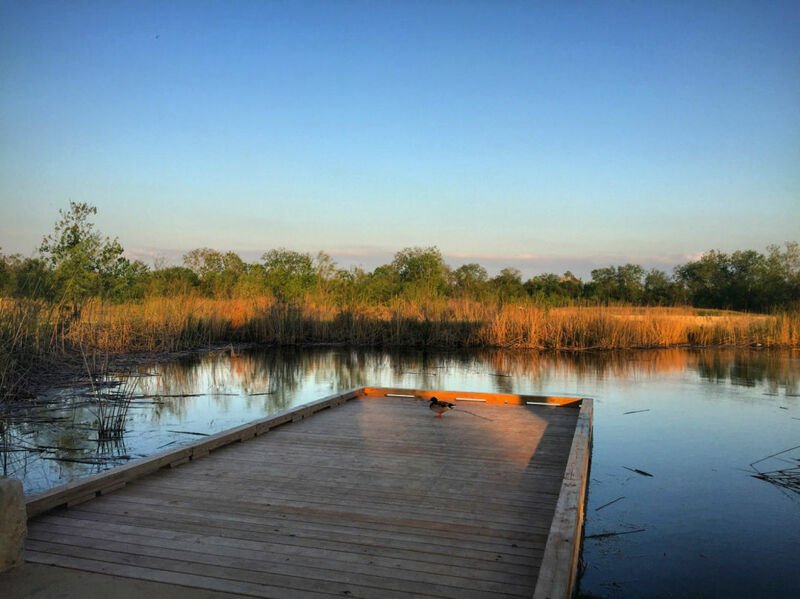 The 1932-era park has some wetland features of its own currently—namely a popular splash pad and water "sprayground" donated by H-E-B—and the connecting trails will no doubt bring even more Houstonians to Hidalgo's baseball field and wooden playground. The waterfowl, I'm sure, will come soon too.